July | 2011 | Professional Use Only, No Warranty. What Is 100% Graphite, Sub-500 Grams & Under $100? Today practically every company in the industry offers a composite stick at the $99 price point catering to the recreational level player. These sticks usually contain little to no traces of graphite and lots of lower end materials. While it is easy to name manufacturers who sell $99 sticks, try looking for one that is 100% graphite and the list shortens considerably. Out of those remaining sticks, filter out the ones that weigh less than 500 grams. There are not many options are there? 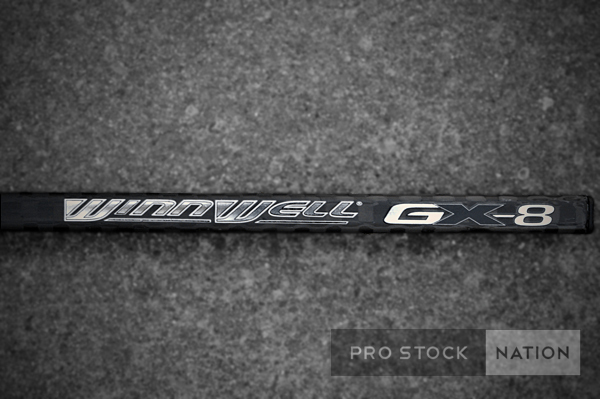 This is the Winnwell GX-8 and if you haven’t already guessed; it is 100% graphite, weighs 490g, and costs $99. 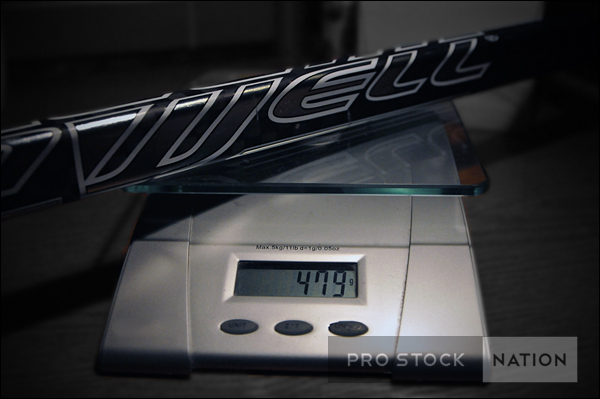 This stick is listed at 490g but we decided to throw it on our scale “naked” (without any tape and uncut from the factory length) as Winnwell’s website lists it at 480g. Our kitchen scale confirms the stick weighs 479g. 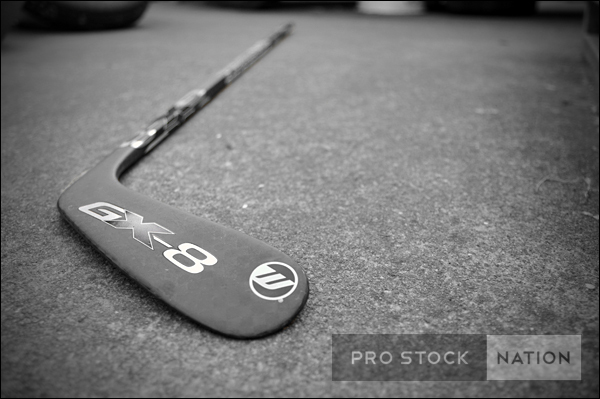 There are several factors that could affect the weight of the stick such as blade pattern, grip/no grip, etc. but what we are interested in here is it is indeed under 500g. We have not used this stick long enough yet to give it a fair test so we will leave any long-term reviews for a later date. So what are our initial thoughts? Well, as soon as we picked up the stick it felt nice. It did not feel like a $99 one piece stick at all. Normally sticks at this price point feel like bricks and tend to be blade heavy. While the GX-8 is not the lightest stick in the world it does offer good balance thanks to Winnwell’s precise weight distribution (or Optimum Pro Balance Technology as they call it.) During a game it will be very difficult for someone to notice a difference in weight when you start talking in grams. Even though it may be slightly heavier, a well balanced stick will feel and perform much better when you are using it. After playing with it during my first ice time the blade is very rigid and pucks do ‘pop’ off nicely. 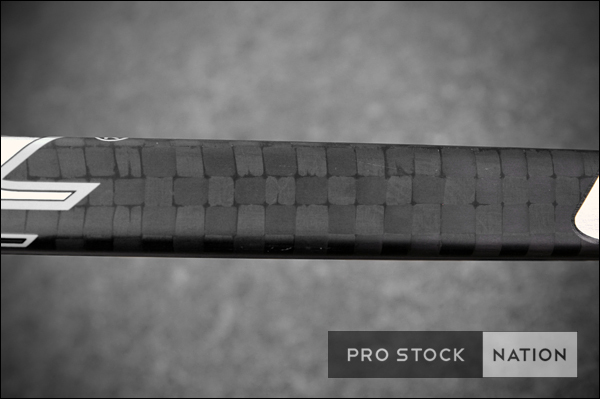 Check out the 12k graphite weaves on the tapered shaft. I really like it when companies show off what their sticks are made of and not try and hide what is underneath with a cheap paint job. This stick has been a great surprise so far and looks to be a great ‘bang for the buck’ stick. 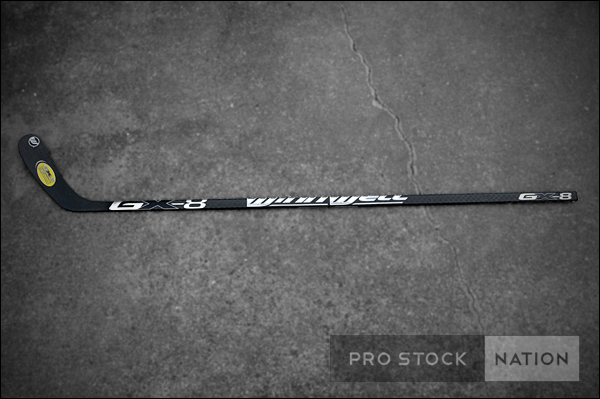 I would recommend this stick to both advanced and recreational players. The only thing I would change is the shaft radius. It is a personal preference but I do have smaller hands and the shaft is a bit boxier than what I normally use. Aesthetically the graphics are simple and that is how I prefer my equipment. Some of my photos may look like they are in black in white but in reality that really is what the stick looks like against the pavement. Rick Nash, Matt Stajan, Marc-Andre Bergeron, and Kyle Quincey. What do all of these NHL players have in common? Their glove of choice is Winnwell. Being a Gold Medal winner, 4-time NHL All-Star and Captain of the Columbus Blue Jackets hockey club, Rick Nash has been heavily courted by different companies to endorse their products. Yet, he chooses to sport Winnwell Pro Stock Hockey Gloves. Here is a glimpse of Rick’s 14″ pro gloves. Over the next couple of weeks I will be using this glove and checking in with updates. These are made of nylon and have plastic inserts everywhere like you would expect from most pro gloves nowadays. All of the graphics and text are embroidered. For players who don’t like overly loose (think traditional 4-roll) or tight (newer anatomical style) fitting gloves these are in the middle. The blooming style cuff also increases wrist mobility. What I liked right off the bat was how the thumb was constructed. The white bit you see sticking out is a plastic insert which offers protection from hacks and slashes. The thumb is allowed to move freely unlike some gloves that will basically have one large piece of plastic from the cuff to the tip of the thumb, restricting movement. The three piece index finger is another feature we like that more and more companies are also incorporating, but mostly into their more anatomically fitting gloves. The palms and gussets of the glove are made of you guessed it, Nash leather (pardon the pun.) An unique feature about these palms are the seamless transitions between the palm and gussets on the inside of the pinky and index fingers which are key areas for wear and tear. The inside of the glove is lined with Winnwell’s Cleansport NXT liner (more information available on their website: http://www.winnwellcleanhockey.ca/cleansport.php.) The NXT extends all the way from the cuff through to the fingers and I actually prefer these types of liners because they are generally softer than what is traditionally used and I don’t get any uncomfortable scraping on my knuckles. *The RBK has had the inner padding and a part of the cuff removed so technically it will weigh a bit more than 702g. Stay tuned… we also have another Winnwell product to show you in the coming days that may surprise you. The Nashville Predators will be holding their equipment sale during their State Of The Union event on July 13, 2011 at the Bridgestone Arena. Season Ticket Holders will be entitled to first pick from 11:30am-1pm and the general public from 2pm-5pm. You are currently browsing the Professional Use Only, No Warranty. blog archives for July, 2011.